At this point in time the old Delta(6603) is no longer available. It has been replaced by the 66031/2. The Delta Decoder is Märklin's cheapest decoder, and the one with the fewest functions. However this can be changed, with some additional components and a solder iron. So what can you do yourself, to make the Delta Decoder better. 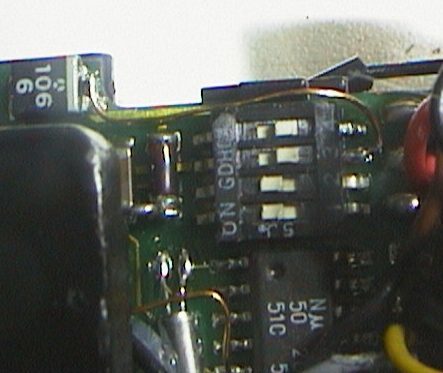 odd or even numbers are set to ON on the 6080/6090 dip switch. 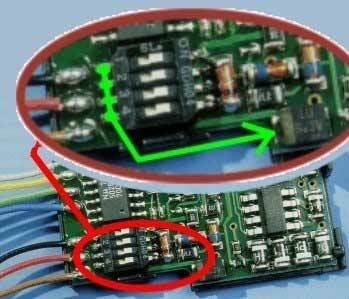 Delta dip switch to eg. the "big" capacitor. Dip1 on the Delta equals dip1+2 on the digital. Dip2 equals dip3+4 and so on. In digital, you use two switches, to make one bit. 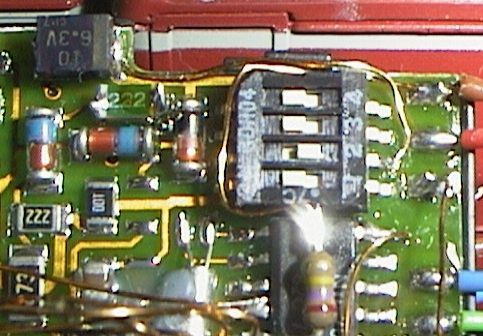 It can either be high, low, or "floating"
a wire to the capacitor. You then solder wires from dip1 and dip3 to the capacitor. 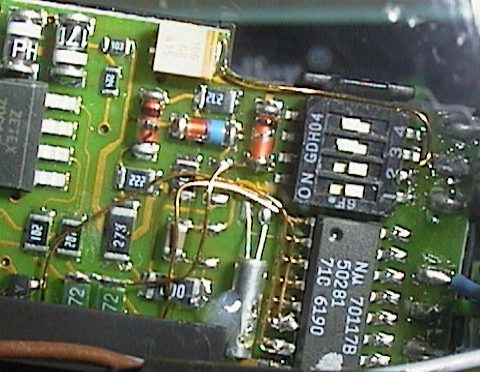 A WIRE TO THE CAPACITOR, THIS WILL RESULT IN A SHORTCIRCUIT ! . If you don't want to modify you Delta decoder, you are limited to these addresses. So maybe it's worth taking the chance. Works, try this excellent page New Märklin Motorola Format by Andrea Scorzoni. Get the function. This modification can ONLY be performed on 701.17-based Delta decoders. is actually only two 10K(can be smaller) resistors and maybe a 2V7 zenerdiode. also remove the annoying flickering you normally se in your train's headlights. and connect your bulbs, Telex or smoke unit, and you have the function. BUT - how do you go about making the conversion. resistors where you find it best. The disadvantages with this method is : where should I cut ? because you don't have to cut at all, so you can always return to the starting point. and gently tweak the pin up, as shown in this drawing. picture. 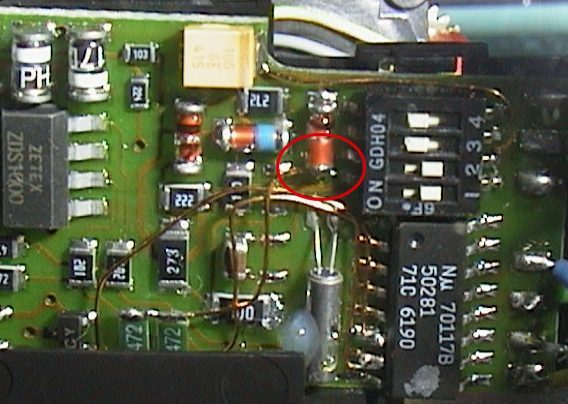 (this is only valid for the decoders where the resistors are placed as shown). 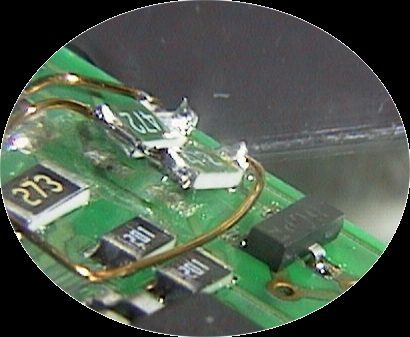 should be soldered at angle, and they should be soldered to the plates nearest the board's edge. 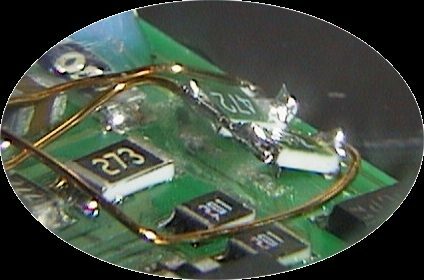 How should you angle the resistors, compared to a normally soldered resistor ? 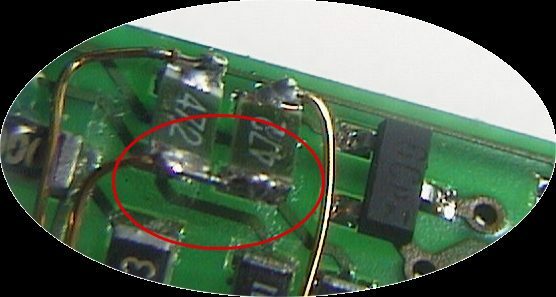 resistors should be soldered together and then connected to the diode right beside the dip-switch. are then to be connected to pin6 and 7 on the 701.17 chip. the bulb-holder is normally integrated in the chassis, so here it is difficult). Voila ! No more Flicker in your light bulbs. with extra components. Check out the digital enhancement page. are satisfied with the bulbs brightness, don't add the zenerdiodes. will burn VERY brightly, and they may burn out fast. You should change the bulbs to 6100xx. You use a 4094 shift register and four transistors. The transistors must be connected to the output of the 4094. And last, you will also need a 270Kohm resistor. F1 and F2 are enabled, but it is possible to enable all four functions. But here you are on your own. more work, than just connecting a premade curcuitboard. First the hard part. 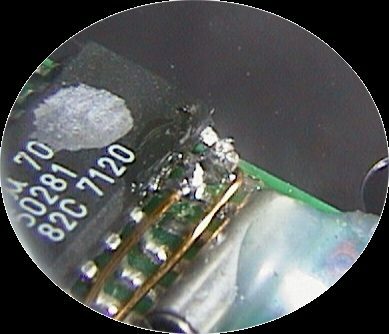 You need to desolder pin 3,4,5,6,7 on the 701.17 chip from the PCB. I find the easiest way, is to use a small screwdriver. You place it between two pins eg 2 and 3.
gently tweak pin 3 up from the PCB. all the 22 Kohm resistors, as shown in the schematic -you can chose not to use them. You can read more about this subject on Dr. König's homepage and Bo Braendstrup's homepage. Bo has a great homepage with allot of modifications to Märklin's Digital system.